Map of Germany (Eastern Sheet). 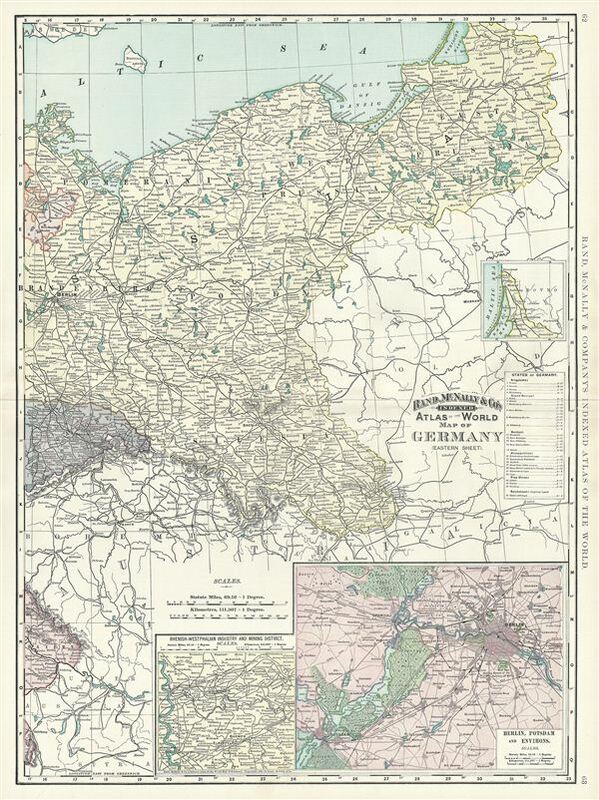 This is a beautiful example of Rand McNally and Company's 1891 map of eastern Germany. It covers the eastern portion of the then German empire, mainly focusing on the Kingdom of Prussia. It includes the modern day nations of Poland, the Czech Republic and Germany. Two insets in the lower right quadrant detail Berlin and Potsdam and the Rhenish-Westphalian Industry and Mining District. A list of the States of Germany is included along the right border while the northern most part of Prussia is featured in another inset near the right border. Prussia attained its greatest importance in the 18th and 19th centuries when it dominated northern Germany politically, economically, and in population. This map was created a year after the dismissal of Chancellor Otto von Bismarck, the 'Iron Chancellor' who during the 19th century, pursued a policy of uniting the German principalities into a 'Lesser Germany' which would exclude the Austrian empire. Color coded according to territories, the map notes several towns, cities, rivers and various other topographical details with relief shown by hachure. This map was issued as plate nos. 62 and 63 in the 1895 issue of Rand McNally and Company's Indexed Atlas of the World - possibly the finest atlas Rand McNally ever issued. Very good. Minor wear along original centerfold. Text on verso. Minor verso repair, bottom margin. Rumsey 3565.016 (1897 edition). Philip (atlases) 1026 (1898 edition).